This creamy smooth carrot soup is teaming with good-for-you ingredients. Onions and carrots provide a sweet and mellow foundation, but the kick comes from a small army of spices: ginger, cumin, garlic, cinnamon, allspice, cayenne and turmeric. Orange and lemon juice brighten the flavors and a final addition of yogurt smoothes it all out. Inflammation is thought to be the root cause of many health problems, from cancer to Alzheimer's. 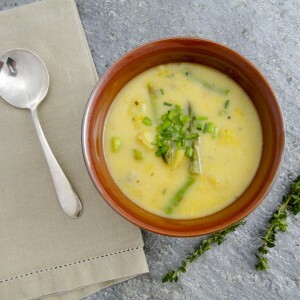 This soup is loaded with anti-inflammatory foods, including: garlic, ginger, turmeric, cinnamon and onions. 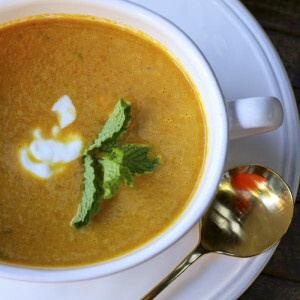 This carrot soup is delicious hot or cold. On a hot night, a cold bowl of this soup is very refreshing. 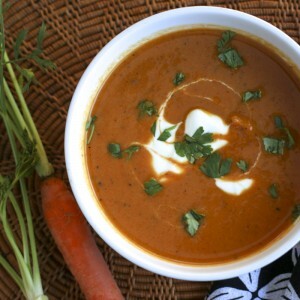 This recipe was inspired by an April 10, 2010 Bon Appetit recipe: Moroccan Carrot Soup that had rave reviews. I have significantly increased the number and amount of spices and herbs to create a more complex soup. See post on cream-less pureed vegetable soups for the three ways to pure vegetable soups. For this soup, I prefer the blender method because it produces the creamiest results. In my opinion, the best soups always start with sautéing the onions. Take your time and sauté the onions for 20 minutes or more. Stir frequently so they do not burn. This extra upfront effort mellows the onions and pays big dividends in flavor. I like to use a molcajete to grind my cumin and other whole spices. 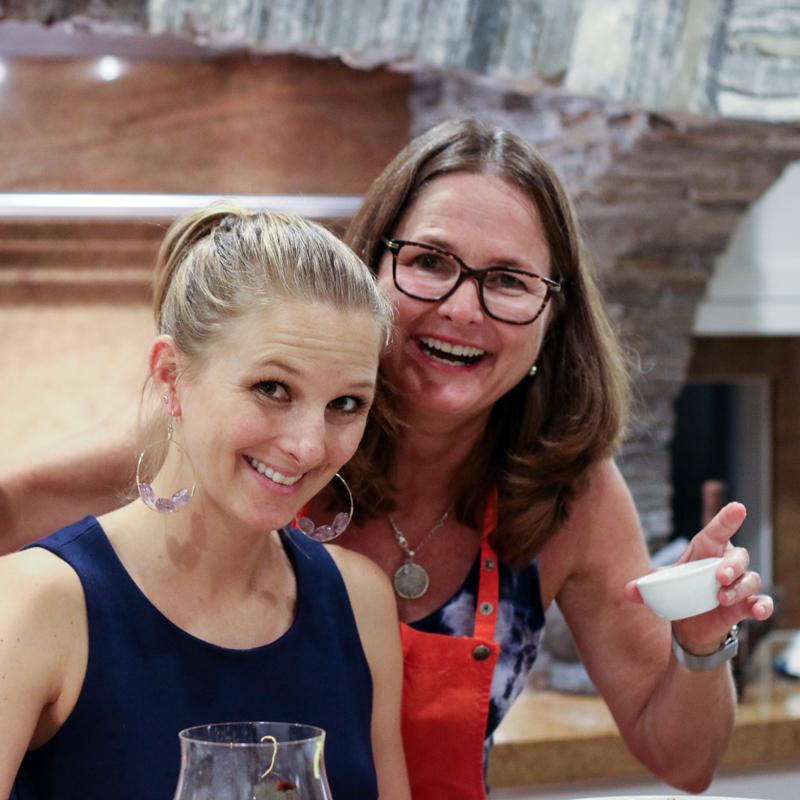 See my molcajete post to learn how to buy and season one. You can also use a mortar and pestle or spice grinder. See posts on preparing garlic and ginger and the best way to zest citrus. If you have a food processor, save your self a ton of time by using it to finely chop the garlic and ginger, first, and then coarsely chop the onions and carrots. A dutch oven or other heavy bottomed large pot is ideal for this recipe. This soup freezes well, so make a big batch and freeze leftovers for another meal. Toast cumin seeds in bottom of your soup pot for a couple minutes, stirring and taking care not to burn. Transfer toasted seeds to a mortar and pestle or a molcajete, and grind them until the seeds are mostly powder. Add butter to the soup pot and melt. Add onions, ginger, garlic and ground cumin. Sauté for about 20 minutes. Add chopped carrots, mint and 7 cups chicken stock to the pot. Bring to a boil, reduce heat and cover. Let simmer for about 20 minutes, until carrots are tender. When carrots are done, turn off heat and add spices and honey. Stir until well combined. Working in batches, puree soup in a blender on highest speed, return the pureed soup to the pot. Stir in 12 ounces of yogurt until well blended. Taste and adjust spices. Add more stock if the consistency is too thick. Serve hot or cold with a dollop of yogurt and a sprig of fresh mint.